World Secrets: Has a Pirate Been Here? STEP UP, ME ‘EARTIES, YO HO! Sometimes you need only to look down to see some Disney World Secrets! When you exit many attractions throughout the Magic Kingdom, you step upon a moving walkway. Normally that there are footprints painted on the walkway to indicate which direction you should go. 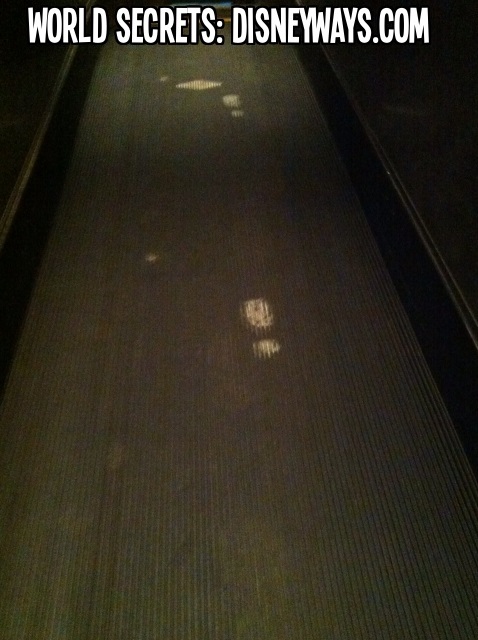 Next time you depart from your boat, look at the “footprints” Disney Imagineers placed on the moving walkway as you exit the Pirates of the Caribbean attraction. The single boot print followed by a small circle are the markings belonging to a peg-legged pirate! Oh, by the way, have you seen the Mermaids?